You might call them the strong, silent type. They don’t say a word, but they’re powerful enough to keep vehicles and pedestrians from crossing into restricted areas. They are known as work zone barriers. As the name suggests, these protective barriers help maintain safety and order in and around construction safety zones. Essentially, they keep what doesn’t belong in a designated area out of that area. 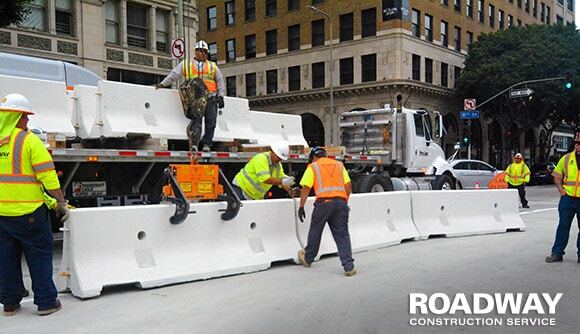 Given the importance of these separators for maintaining effective traffic control, Roadway Construction Zone devotes abundant resources the selection and deployment of work zone barriers. If you’ve ever set foot on a sidewalk or motored down a road in a vehicle or aboard a bicycle, you no doubt have seen plenty of work zone barriers. One of the most common of these is cones. Highly visible thanks to their fluorescent coloring (typically orange), they are the smallest of the bunch. Despite their compact dimensions, however, they do a great job keeping everything in its place. Because of their high visibility, cones are effective protectors of everyone from pedestrians to work zone safety personnel. Often, mere visibility isn’t enough to ensure maximum protection to crews, pedestrians, and motorists. In these cases, road traffic management providers must tap into something more powerful. That something typically is k rail, or as it is sometimes known, Jersey barrier or Jersey wall. That’s exactly what they are – big, powerful walls. Their task is evident from their size – keep vehicles from crossing into restricted areas. K rail is especially useful when a project calls for lane closures. Somewhere between cones and Jersey wall are the intermediate-sized traffic guards known as type 3 barriers. Like cones, they’re a common sight around town. Typically, they take the form of three high visibility horizontal boards mounted on a stand. Linked together side by side, they create an effective portable wall. Often seen at public events as well as in work zones, type 3 barriers make excellent pedestrian barricades. When providing temporary traffic control, Roadway Construction Service often deals with the issue of work crew access to public ‘right of way’ areas. To gain such access, workers must be authorized by municipal encroachment permits. For projects requiring such authorizations, we’ve developed an effective program for the acquisition of encroachment permits. Thanks to the experience and skill of our permit specialists, we consistently cut through the municipal red tape to secure these needed authorizations quickly and efficiently. Naturally, requirements and criteria differ from district to district. Rest assured, however, Roadway Construction Service knows what these differences are and precisely how to deal with them. Would you like to learn more about deploying effective work zone barriers for your work zone project or special event? Reach out to Roadway Construction Service any time. We’ll be happy to provide additional information and answers to all your questions.